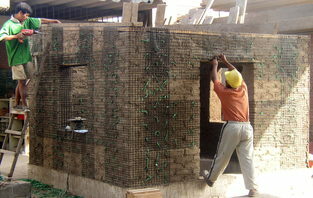 This is an overlay of reinforcing mesh bonded or attached to a masonry wall to provide reinforcement. 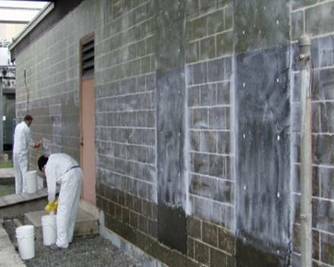 The reinforcement is usually in the form of fibre reinforced polymer (FRP) mesh or fabrics using glass or carbon fibres bonded to the wall with a resin, or polymer grid (geogrid) attached to the wall with plastic or nylon ties. Mesh is often also placed on the interior surfaces of walls and to surfaces of interior walls. 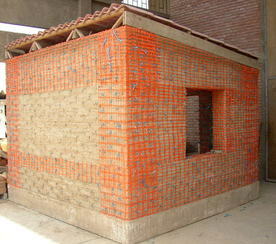 The mesh is usually plastered over. 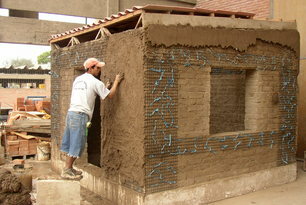 Cement or mud plaster is used. 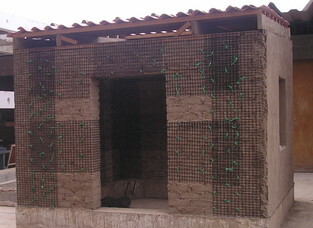 This type of reinforcement is often installed in existing buildings as a seismic retrofit provision.